London’s increasingly occasional Mayor Alexander Boris de Pfeffel Johnson is not a happy chappie today: a 24-hour strike has been called by unions representing those who drive the capital’s Underground trains. The point of dispute is Bozza’s determination to run a 24-hour service on some lines at weekends. Accusations of political motivation have been made by the Mayor; management have been accused of sharp practice by unions. The result, though, is not in doubt: from later today, Underground services will run down and there won’t be any tomorrow. Given the numbers that use the system for commuting, shopping, and socialising, that is going to inconvenience a lot of people. What’s to be done to prevent this kind of thing happening? Well, some might suggest that management and unions should try a little harder to resolve their differences. Some, though, want more. Yes, it’s time to dust off that old chestnut called Automation. Some Metro systems around the world are automated; therefore automation is the answer. After all, Bozza has pronounced more than once on the issue. He’s briefed the press. 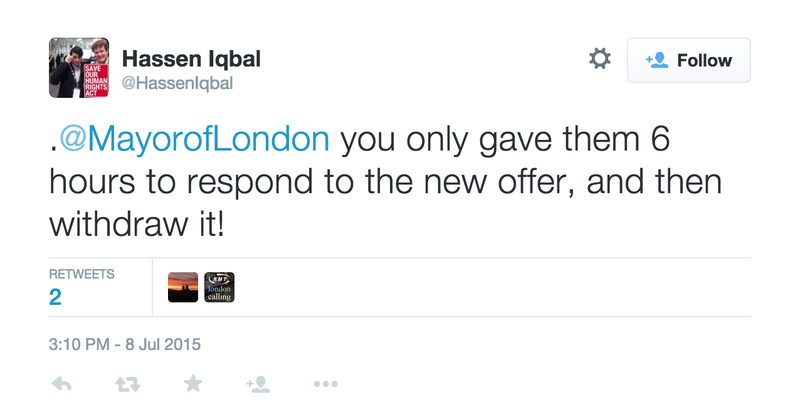 And thereby hangs the problem: the press no longer employs specialist transport journalists. Bozza says automation is just around the corner; that is what they print. So while the Mayor harrumphs “Tube strike politically motivated - union bosses need to explain why they refuse to put new offer to members - disgraceful - call it off”, and gets a dose of reality in short order as Hassen Iqbal reminds him “you only gave them 6 hours to respond to the new offer, and then withdraw it”, those of a more right-wing persuasion have convinced themselves that automation will rescue them soon. 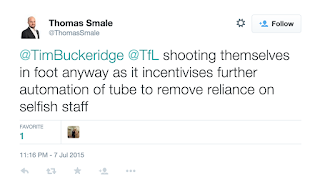 Thomas Smale declared “@TfL shooting themselves in foot anyway as it incentivises further automation of tube to remove reliance on selfish staff”. 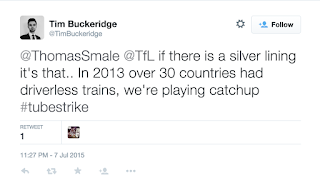 Tim Buckeridge was of similar view: “if there is a silver lining it's that.. 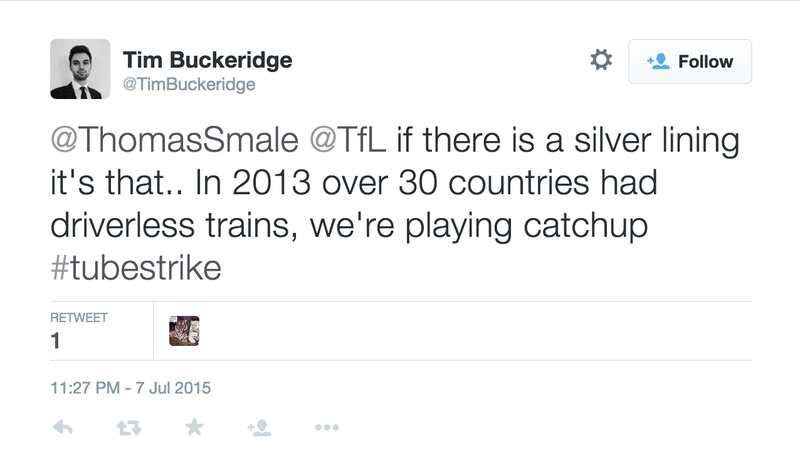 In 2013 over 30 countries had driverless trains, we're playing catchup”. I suspect none of them have trains running in single-track tube tunnels, or have converted routes without first renewing the signalling. That did not deter Tory councillor Richard Holloway, who asserted “can't wait for tube automation … thankfully I'm only 31. I'm pretty sure we'll see it in the next 10 years”. Ron Hopeful speaks: we’ll see nothing without new trains, new signalling, and a raft of safety measures, and that won’t come any time this decade OR THE NEXT. The first possibility is with a new Piccadilly Line fleet - which is several years away. But, it seems, very few on the right are for listening, typified by Peter Thompson, who has declared simply that “We must fully automate the tube, it is long overdue”.This might give him that all-important warm feeling, but it will change nothing: automation of the Tube is at least a decade and a half away, if it ever happens at all. 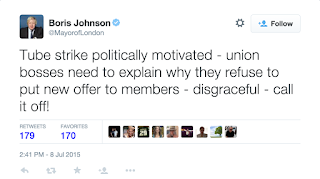 The only way to cut down on strikes, as Winshton might have put it, is “jaw-jaw instead of war-war”. 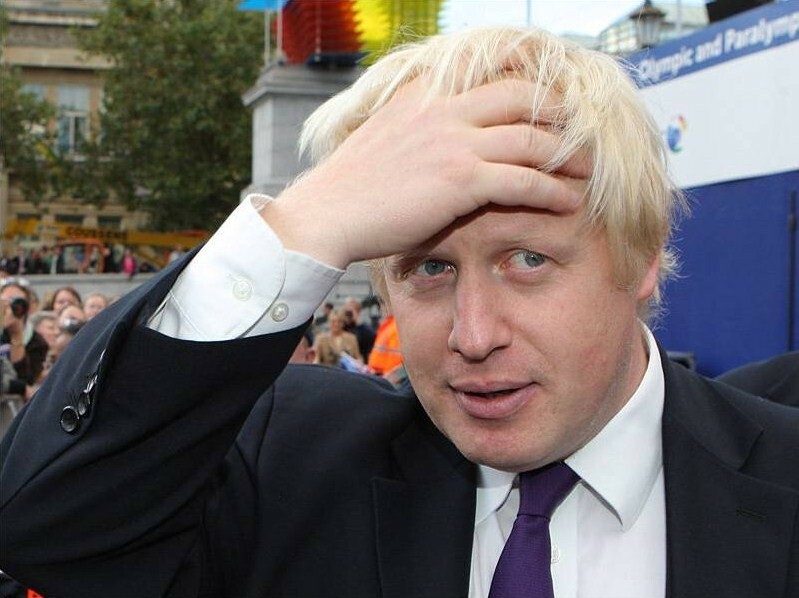 The sooner Bozza and his right-leaning supporters get that into their heads, the better. So in Lahndan they're queuing up and choking on their own carbon monoxide. Surprised at the MPs, especially right wing, response to a strike for better pay to compensate for working non social hours when they have just received a large pay rise. And they have only just recently done away with some of their anti social working day routine (albeit to the possible detriment of having to make anti social hour time for their other day jobs). Interesting comparison of "other cities" automated systems on a day when they were still reporting the 7/7 anniversary events. You'd have thought with the events so close they would have asked the question "what would 7/7 have been like with automated trains?". 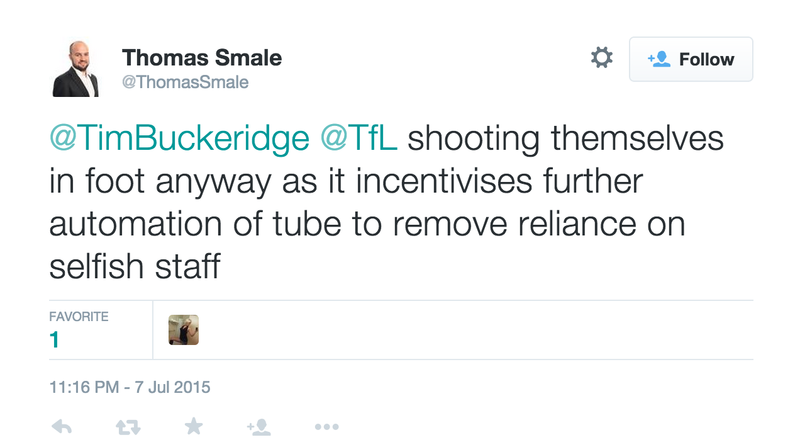 And don't forget the de-staffing of stations. What the bean counters forget is that a lot of peple in this country aren't worth their pay on normal days, but some of them earn it when things go wrong (obviously excluding the bean counters). "what would 7/7 have been like with automated trains?" Equally horrific, but no worse. There have never been any proposals, outside the minds of people with no influence at all over TfL, to have unstaffed underground trains. 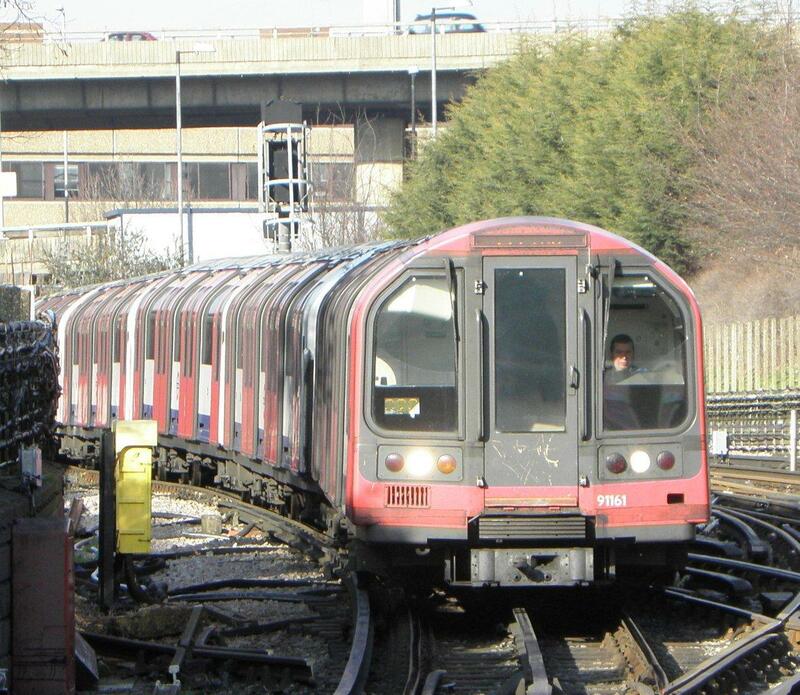 DLR train captains would have done just as good a job as drivers at the initial 7/7 response - probably better, as onboard safety is their sole training rather than a distraction from their driving job.